Some of us stayed for weeks, some for months, some forever. -from How I Became One of the InvisibleSince its first publication in 1992, David Rattray's How I Became One of the Invisible has functioned as a kind of secret history and guidebook to a poetic and mystical tradition running through Western civilization from Pythagoras to In Nomine music to Hoelderlin and Antonin Artaud. Rattray not only excavated this tradition, he embodied and lived it. He studied at Harvard and the Sorbonne but remained a poet, outside the academy. His stories "Van" and "The Angel" chronicle his travels in southern Mexico with his friend, the poet Van Buskirk, and his adventures after graduating from Dartmouth in the mid-1950s. Eclipsed by the more mediagenic Beat writers during his lifetime, Rattray has become a powerful influence on contemporary artists and writers. Living in Paris, Rattray became the first English translator of Antonin Artaud, and he understood Artaud's incisive scholarship and technological prophecies as few others would. As he writes of his translations in How I Became One of the Invisible, "You have to identify with the man or the woman. If you don't, then you shouldn't be translating it. Why would you translate something that you didn't think had an important message for other people? I translated Artaud because I wanted to turn my friends on and pass a message that had relevance to our lives. Not to get a grant, or be hired by an English department. 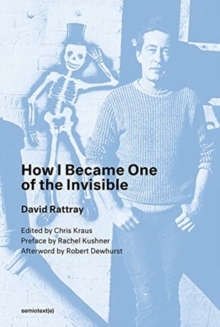 "Compiled in the months before his untimely death at age 57, How I Became One of the Invisible is the only volume of Rattray's prose. This new edition, edited by Robert Dewhurst, includes five additional pieces, two of them previously unpublished.